Both useful and interesting, the REDD plugins bring the authentic sounds of vintage consoles to modern DAWs. Great sweetening EQs. Can process in M/S mode. Some glorious non-linearities. Good LF combinations in REDD.37/51. Very good overall sound. Drive can become unpleasant. No Shuffler or Spreader controls. 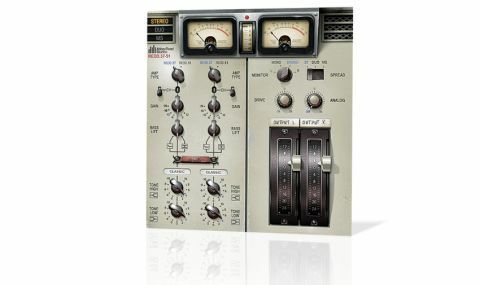 REDD is a two-plugin pack (VST/AU/RTAS) developed by Waves in conjunction with Abbey Road Studios, modelling the classic valve mixing desks used there from the late 50s until the late 60s. "One plugin models the classic REDD.17, the other covers both its stablemates: REDD.37 and REDD.51"
One plugin models the classic REDD.17, the other covers both its stablemates: REDD.37 and REDD.51. The only difference between the latter two was in the amplification circuitry, so the REDD.51 option was achieved by modelling the later amplifier (REDD.47) and combining it with algorithms from the REDD.37. The plugins can be loaded in mono or stereo versions, with the stereo ones offering the same operation and monitoring modes as the originals: stereo, dual mono and mid/side operation, with monitoring in stereo, summed mono, mono left or mono right. To emulate the differences between the two types of channels involved in this setup on the original desks, Waves have modelled two separate channel paths for each plugin, and presented them as options I and II. For true authenticity, you can run the stereo instances with one of each (I and II), emulating the idiosyncrasies of the hardware. All models have Low and High Tone controls, a Bass Lift and a 10dB pad. On the REDD.37/51, Tone controls have two modes: Pop and Classic. The VU meters' zero point can be calibrated (-24dBFS to -8dBFS), and rounding things off are two knobs you won't find on the real hardware: an Analogue knob for dialling in noise/hum and Drive, both ranging from -24dB to +24dB. REDD lacks only two of the hardware's features, namely the stereo Spreader and Shuffler. Even with all the controls flat, all three models have an influence on the sound of the incoming signal. The most obvious aspect of this is a curtailing of high frequencies, with REDD.17 having the most profound effect. They also all appear to have similar underlying EQ designs, albeit with different gain extremes and the Pop/ Classic options mentioned above. In use, however, it quickly becomes apparent that the REDD.17 and REDD.37/51 are quite different from each other. First up, REDD.17's EQ is less powerful than the corresponding settings on REDD.37/51 - even when using the Bass Lift and Low Tone boost, the shelving boost it produces is still very gentle. "The REDDs are gorgeous vintage tone controls that can be used to add fatness to snares and kicks"
The High Tone is also a gentle shelf in both boost and cut mode. On the REDD.37/51, the Classic setting is similar to the REDD.17 but more powerful, while the Pop setting switches the High Tone to a broad bell shape at 5kHz (but only when boosting). However, it's the Pop mode Low Tone setting that's really interesting. In cut mode, it can be combined with the Bass Lift to create an excellent low frequency scoop around the 200Hz mark. As mentioned, Waves have added a Drive circuit, and this attenuates both high and low frequencies when at extreme settings. So where does all this leave us? In essence, the REDDs are gorgeous vintage tone controls that can be used to add fatness to snares and kicks, low-end welly to basses, overall crispness to snares and a general sweetness to sub mixes. On the downside, the Drive control isn't that great, sounding nasty pretty quickly as you wind it up. However, the analogue noise and hum with full level control is an improvement on earlier Waves plugins that had only an on/off switch. Overall, this is a cracking pair of vintage console channels/EQs, packed with curious and ear-pleasing non-linearities.